Tried to install Lubuntu 19.04 daily, but the installer got stuck at 33% trying to install locales. What I wanted was to install Lubuntu 19.04 daily and install Unity on that., and also to check if the “former” Lubuntu is still available in 19.04. Then tried to install Lubuntu 18.10 on both MBR and UEFI laptops, but got the same result as before. So, tried the next in line, Lubuntu 18.04, and that got installed in a breeze. Updated it and then changed the repo from bionic to cosmic, updated and upgraded it to 18.10. Quite a lot of KDE and QT packages were installed. Interestingly, I booted into the former Lubuntu DE. Then changed the repo to disco and updated and upgraded it. Still, I booted back into the former Lubuntu DE. Rebooting again, I checked at login, the top right corner on the panel to see how many DEs/WMs available – Lubuntu-qt, Lubuntu-gtk, Openbox and Plasma. Out of them, Lubuntu-qt didn’t boot. Not much of a problem. Hint: if anyone wants to use the former Lubuntu, they can just ignore the different DEs and WM, and keep on booting normally to the known Lubuntu with 19.04 base. Just put your password and click Enter. I chose Plasma, and booted into a beautiful DE, quite a snappy one. Changed lightdm to sddm. I could quite easily boot to either the “former” Lubuntu-gtk or Plasma. Later uninstalled Lubuntu, the gtk and the qt parts of it, and rebooted only to Plasma. Openbox is still there, but can’t be booted, as the configurations are not there (or taken off) in Lubuntu. I’ll add the configurations to Openbox later. One might say, no need to go to so many steps to install Plasma DE, just install Kubuntu, but I wanted to see if the former Lubuntu is still available in 19.04. The former Lubuntu was without all kinds of extra stuff, such as KDE apps, just Openbox with a DE. The new Lubuntu is kind of a mix, somewhat bloated. Kwin in Plasma is a snappy WM, just like Openbox in the former Lubuntu. Tried to install Lubuntu 19.04 daily, but the installer got stuck at 33% trying to install locales. You have to wait more than a minute. It’s not permanently stuck, it just takes a minute. It’s a known bug. and also to check if the “former” Lubuntu is still available in 19.04. This is the first Lubuntu release with LXQt as the main desktop environment. The Lubuntu project, in 18.10 and successive releases, will no longer support the LXDE desktop environment or tools in the Ubuntu archive, and will instead focus on the LXQt desktop environment. Also noted in our release announcement, the upgrade path currently isn’t supported, and it breaks a lot of things; however, we have a page in our manual about it. Please, nobody do this. There’s a reason we ditched LXDE, and that’s because of the bitrot that has become increasingly apparent lately. Please don’t expect support from the Lubuntu team. I mean the best when I say this, but please, next time could you read the release announcement? I am not exactly happy with PCManFM-qt. I don’t need half the file manager taking up the folder and partition names (left panel). The idea behind Lubuntu was to give a snappy DE (+ a snappy WM) use in older computers and it actually flew in newer computers. Upgrading from Lubuntu 18.04 to disco, showed that there is a Plasma DE hidden inside it. Lubuntu LXQT might not have the plasma-session in /usr/share/xsessions, it can be simply added, and if Plasma is uninstalled, it can be installed back an have the snappier Plasma DE. The “former” Lubuntu would be available in the repos till 2021, and maybe some more years after that. While Lubuntu 18.04 is still there, the lubuntu session cannot be deleted. Openbox won’t go away for a long time too. You see, I am in a way glad that I couldn’t install both Lubuntu 18.10 and 19.04 this time, for it gave me a chance to upgrade Lubuntu 18.04 to 19.04 and to find the Plasma DE. This is the standard upgrade path I usually take. Instead of installing Unity over whatever the result of upgrading, I found Plasma DE, which boots much faster. And, it is a beauty! Btw, I am not really worried about “bit rot” as I have an Openbox install that had been upgraded to 19.04 base. And, it is the snappiest install I have! The Plasma DE with Kwin is the 2nd snappiest. Btw, this install was done on an older Pentium laptop. I am not exactly happy with PCManFM-qt. I don’t need half the file manager taking up the folder and partition names (left panel). That’s easily resizeable, just drag the panel. The idea behind Lubuntu was to give a snappy DE (+ a snappy WM) use in older computers and it actually flew in newer computers. 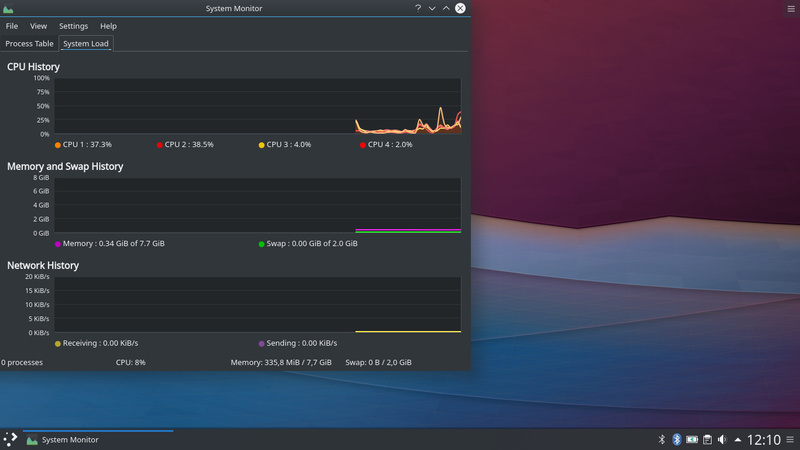 This is a bug, and if you want the best Plasma experience out of the box, install Kubuntu. I can’t reproduce this at all, on any of my machines. We should take steps to manually ensure this session is removed, because this is in no way our intention. Then you really should be using Kubuntu; they’ve done a lot of polish to the Plasma desktop by default. From a developer’s perspective, you should be. The matter of PCManFM-Qt, I mentioned that here in May (only one, who responded btw). Keeping half the app window to look at the folder/partition names is a waste of area. Dragging is not the solution. 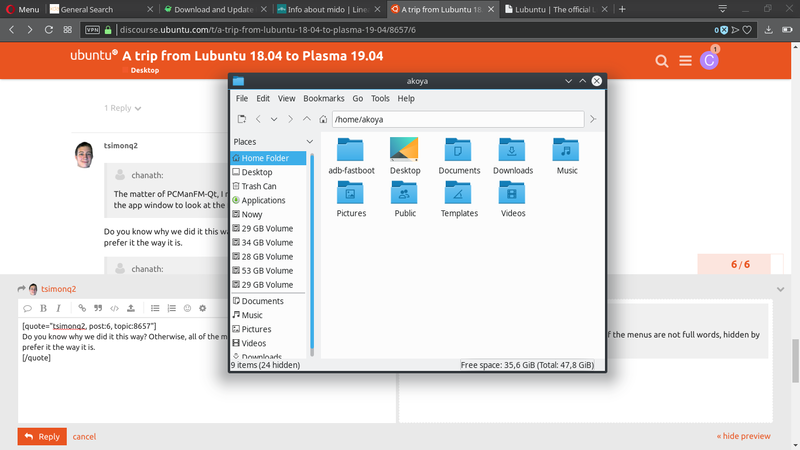 Plasma-desktop is available in the repos. Anyway, there are so much KDE packages in Lubuntu-qt. It was not my original idea to install Plasma DE, but it was just there. Good, but it is not a problem to create that session. LXDE is something that cannot be deleted too from the repos for quite sometime. Openbox is not going away in the far future. Well, that question cannot be avoided. The link to Lubuntu 18.04 release is deliberately hidden here, while Lubuntu 16.04.3 is there. I had to go “previous releases” to find that. So, when Lubuntu 18.04 is hidden away, with the old Lubuntu in it, why not change the name to Lubuntu-QT, or Lubuntu-LXQT? The Lubuntu was/is Openbox+LXDE and it is not going to be there. Do you know why we did it this way? Otherwise, all of the menus are not full words, hidden by “…” - I’d prefer it the way it is. This is because you decided to upgrade and not follow our advice. It’s pulled in via some recommends that aren’t smart. Lubuntu.me is our only official website, Lubuntu.me is a fan site. We display it very prominently on the download pages there. It’s also the only place to find our official release announcement with actual content. PCManFm on the Plasma desktop with 19.04 base. Lubuntu.me is our only official website, Lubuntu.me is a fan site. All right. Didn’t know the above. Somehow the old introduction, how Lubuntu started had gone from the official/fan site – only place to find that is Wikipedia. I understand that we move forward, if we are dropping the history, then we should either drop the name or change it. Wish you luck with the new distro. This is because you decided to upgrade and not follow our advice. Once there was quite a crowd, who did that, and the forum around it was thriving. Anyway, I always do that, whatever the result. The difference between today’s daily and yesterday’s daily is squashfs-root. Upgrading one’s install gets the last (or even newer) packages that went to the last squashfs-root of a given distro or what one had derived. The dubious value of this thread seems to have been exhausted, so I’m closing it. Future readers - read the entire thread before trying it. There are several reasons @chanath ran into problems. Learn from that experience instead of trying to duplicate it.